"Lorraine was the perfect officiant. She was completely committed to our vision for our wedding which consisted of a pretty loose concept with a few specific parameters that was reasonably untraditional. 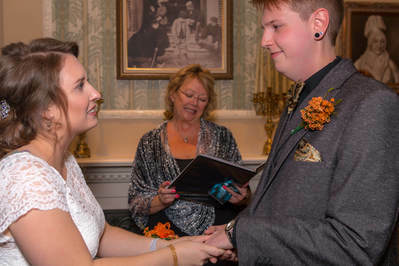 We met over Skype and exchanged a few emails and she fleshed out​ our loose ideas into a very beautiful ceremony that we had plenty of time to review and provide comment - we didn't have many to make since it was on point. She reminded us that she could make edits as the ceremony evolved and that it was our day and should be just what we expected and wanted, which we appreciated since it was a little offbeat. She took care of all the legalities, which was helpful since we do not live in Canada. 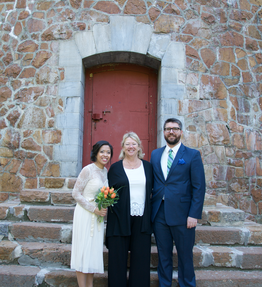 ​Lorraine was a fantastic officiant!!! From start to finish she did a wonderful job making sure we were ok and the ceremony was exactly what we wanted. After our ceremony our guests were shocked to discover she was able to write such a great wedding with only a few meetings and phone calls, and she had us down pat!! Funny and creative with our crazy "Habs Fans" themed wedding, she had ideas of her own as well as how to make our kids part of the ceremony. ​Right from the start she jumped on board with us and made our wedding perfect !! couldn't have had a better officiant!!! "Lorraine was absolutely incredible! She was the perfect match for what my husband and I wanted. 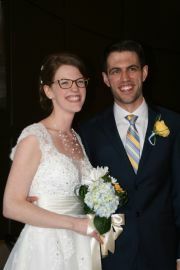 She helped us created a beautiful ceremony that included every detail we wanted. She tapped in to our wants and made our day absolutely magical." 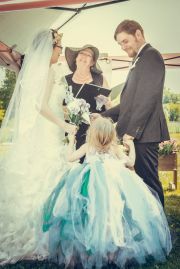 I couldn't have imagined having any other officiant as kind and as friendly as Lorraine Cowan. She made us feel at ease as we all know planning a wedding can sometimes feel hectic. ​Lorraine gave us a great vibe right from the first time we met and my husband and I would like to thank her for being so easy going and for being such a sweet person! We would certainly recommend her. 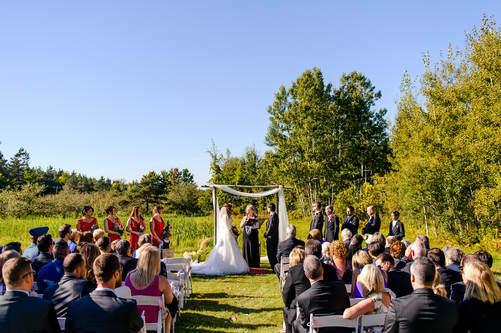 "It was truly a beautiful ceremony and you were the perfect choice. And I want to thank you for making everything so easy!" "Thank you for everything and for giving us the best ceremony I could have imagined. It was absolutely perfect"
​"Lorraine was amazing, very friendly and compassionate. She loved hearing about our story and was willing to work hard with us to build whatever ceremony we wanted with plenty of helpful feedback along the way. Loved the service!" ​"Lorraine was amazing! You can really tell she enjoys her role. Her energy and flexibility was appreciated for our special day. Would highly recommend Lorraine." ​"Lorraine was absolutely incredible. Before the ceremony her instructions were clear and concise. The planning was efficient and thorough and the ceremony was absolutely AMAZING! She was poised and well spoken. She was funny and inclusive of the entire group and she really executed the vision of what we had planned. The ceremony was more than what I could have hoped for. Thanks so much Lorraine!" 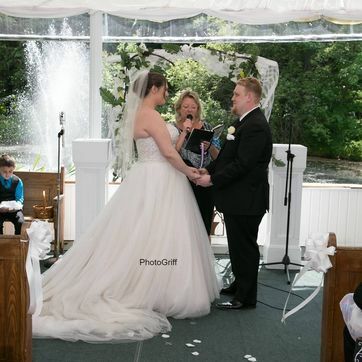 ​"It was a pleasure having Lorraine Cowan as our wedding officiant. She was always on time, happy, ready to help with every detail and very organized. My husband and I highly recommend her services! Thank again Lorraine for everything you did to make our wedding day as perfect as it was :)"
"​Lorraine was available to me any time to answer all of our questions and she really helped us personalize our ceremony. She brought professionalism and poise to our lovely outdoor ceremony. Thanks again so much for making our day so special!!" Serving Greater Montreal and Eastern Ontario, from the US Border to Ottawa.